Hey, Pyjama Bosses. Welcome to another episode of Pyjama Bosses TV, and yes, you guys see right, we are not in the office today. I’m about the jump and have a tennis session. I have a couple usually a week to keep the sword sharp, and in today’s episode, the reason I’m coming at you today from here from the tennis courts is because I’m going to be comparing network marketing and having a system in network marketing to Rafael Nadal. So yeah, that sounds again, a little bit crazy, right? So as usual, if you stick until the end of this video, you’re going to find out what I mean by Rafael Nadal compared to have a system in network marketing. So I’ll see you in 2 seconds. Hey, Pyjama Bosses. Welcome to another episode of Pyjama Bosses TV. I just finished my lesson. As you can see here, I got changed. I was a little bit sweaty, and I thought maybe instead of doing it before the lesson, I can do it right after. Just there you go, I can close the door now. And now I can easily tell you what I was kind of promising at the beginning of this video, which is what does Rafael Nadal have to do with a system in network marketing? 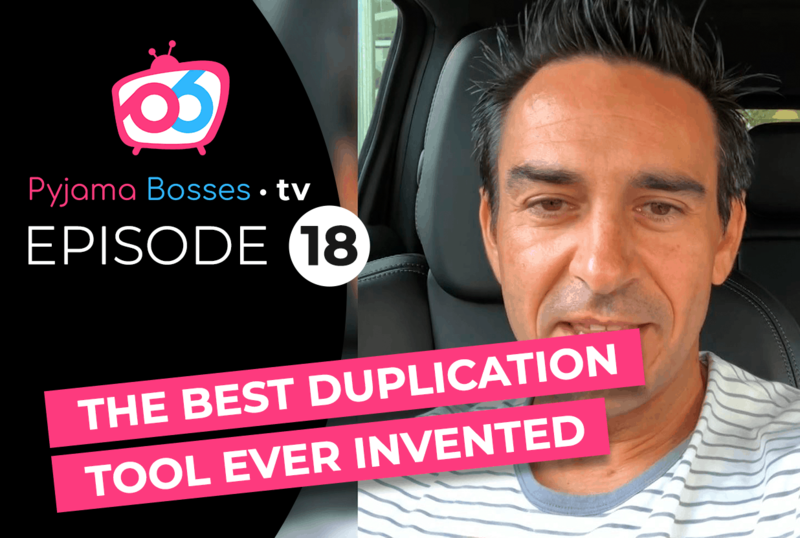 And as you know now, based on … if you haven’t watched any of the other episodes, I was talking to you in the last one about the best duplication tool ever invented by mankind, which was Google, right? And the whole principle of Google, and again, if you haven’t watched it you should probably go and watch that first, is that if the team doesn’t know something, they should what? They should find it in the system, right? When you don’t know something, you basically … what you do is you google it, right? So if you apply the same principle to MLM, it’s about finding whatever answers the team needs in the system. So what does a system have to do with tennis and Rafael Nadal, right? So hear me out. So, be patient, you know? And hear me out in the next few minutes. You’re gonna find out exactly what I mean. Hopefully it kinda makes sense for you. As you know, I like putting real life examples and I have my own way of seeing things. And here’s another one, right? So just play with me for a second. So let’s say that Rafael Nadal has just been playing here in Australia. The Australian Open, right? And basically, he just finished, he’s won the Australian Open, and you probably were there. Let’s just say that you are there on the stands, you know, watching the whole final. And as he finishes the game, right, he picks up his trophy, and he’s walking around with the trophy, and he sees you and he says, “Hey Peter! Yep, you know, let me come for a second.” So he comes to you, he gives you his racquet, right? The racquet he’s been playing with on the final, in the Australian Open. The racquet which he’s used to win the Australian Open. And he gives the racquet to you. And he says, “Hey Peter. Come with me. Let’s go down to the tennis courts to Rod Laver. Centre court, and let’s just play, and hit some balls with me.” Right? What do you think is gonna happen? What is the first thing that is gonna happen? Well, just because you have Rafael Nadal’s racquet, do you think you’re gonna be, like, Rafael Nadal? Well, probably not, right? I would say probably you’re not gonna be very good, probably unless you’re a pro already, right? But just let’s say that if you haven’t played tennis for a long time, you’re not gonna be very good at it, right? So, if I take the same example, and I go to network marketing, right? When people say I have a system, they believe the system is the silver bullet, right? It’s the actual thing, it’s like the racquet. The racquet that is going to win The Australian Open with, right? And, it doesn’t work that way because as you probably know, when you go into centre court, and even if you take Rafael Nadal’s racquet, or even Roger Federer, whoever … a professional racquet, and you start hitting some balls, you’re not gonna be very good at it, right? But here’s the thing that is gonna happen. As you practise, Rafael Nadal or whoever you have right next to you that is a pro, right, is going to help you to course correct what you’re doing. Now, you have the right racquet, right? You are in a beautiful place. That means that there is absolutely no excuse that you have on the surroundings, right? The racquet let’s say is the system, the centre court that you are playing with is the network marketing arena, and the ball is the product, right? For example, let’s say that you’re not hitting the product, right? But you’re using it. So what happens is, again, with the racquet … the racquet is not going to be the silver bullet. The silver bullet at the end of the day is you practising over and over, hitting some balls. And as you hit the balls, Rafael Nadal in this case is gonna say to you, “Well, maybe, Peter, instead of hitting the ball like this, maybe you should hit the ball and give it more spin. Or from low to high,” and all these series of things. And he will course correct every time you hit the ball, right? He will course correct what you are doing, right? Until you become better at doing that, by you practising . When you take the same principle, and you take it to network marketing, and when you have a system, people think just because they have a system, they automatically are gonna become millionaires, right? And it doesn’t work that way. If you don’t use the system properly, right, you’re not gonna have the proper results. But having a coach, or having a mentor that knows how to use the system; that has been using the system for awhile, that knows exactly how you should be using it, every time you use the system, right, and you talk to prospects, and you prospect them, and you invite them to have a look to your opportunity. Every time you have a brand new team member and you teach them on how to become better at inviting and prospecting and doing all those things … What a mentor or a coach is going to do, or sponsor, right, in this case sometimes, is going to course correct how you’re using the system, right? But the system is not going to be the silver bullet. The same way that the racquet, because Rafael Nadal gives you the racquet, you’re not gonna become an Australian Open champion straight away. You’re gonna have to practise. Now, what happens over time, lets say, on the tennis kind of example, when you start hitting some balls, you’re gonna be course corrected, right? And you’re gonna become better at doing that. Now, are you gonna become a Rafael Nadal or a Roger Federer? Most probably not. There is only one of them, right? And we’re all unique. But here’s the thing; you’re going to become the best that you can be at hitting balls and playing tennis. And that’s the end game, right? You becoming the best that you can be. So when you take the same principle again and you take it to network marketing, and everything that you’re doing, it should be pretty much the same. You’re using the system, you’re prospecting people. As you’re prospecting you’re gonna find some challenges. You’re mentor, the coach, somebody that has been using the system longer than you, is gonna course correct what you’re doing, right, as you give them some feedback and say, “Well, this is what I’ve done. This is how I did it.” And they’re going to say, “Okay, well maybe next time you need to try this, you know? Follow this process, don’t deviate from this, and maybe if you instead of saying this, you say that, maybe your prospect will be more likely to maybe have a look to your opportunity, right? Or more likely to sign up. Or more likely to show up for a three way call.” And so on, right? But the system as such will not be the one that is gonna give you the feedback, unless you ask someone, right? And so when you compare both, and the end of the day, we all look for external factors, shortcuts, and kind of what is the secret? You know, the secret to success. Well, the secret to success at the end of the day … obviously, I don’t think there is much of a secret, right, which is putting the head down, going to work, finding the person that can actually show you the way, show you the quote unquote “shortcut.” Right? For example, this week, one of the things that we’re doing is something called Momentum Week. Basically we see network marketing and the business like a 30 day cycle. Not an 18 day blitz, but a 30 day cycle. Where, at the last seven days of the month, we compress all the exercise, we compress the energy, we compress the action, and we get every single person that is using the system around the world to come on a webinar, to every single day for 15 minutes and give them some motivation and some course of action and some course correction also. So they can actually go back and use their systems to actually become more productive, right? So just as a note for you, just to leave you again to enjoy the rest of your week, hopefully that kinda becomes a little bit more useful to you because whatever you’re doing in network marketing right now, if it’s not working obviously there is something that you need to do to change it. And if it is working, maybe there is a point in time where you should probably start documenting what you’re doing, putting that in a process, taking that process, putting that inside a system, and then getting people to access that process over and over again, and teaching people to access that. And then as they are doing that, your course correct that person on how their using it. So that way, you become let’s say the Rafael Nadal or you become the actual coach. And you’re coaching that person when you’re giving them the racquet, which is the system and the process inside the system. And then what you’re gonna be doing is you’re coaching them and helping them day in and day out and course correcting what they’re doing, so you can actually help them to have more results. And at the same time, they can go and help others. Okay? So, anyway, as you can see, I’m quite sweaty so I better get on with my driving back home. And in the meantime I just wanted to come and say hi and hopefully kind of share with you this concept of tennis and having a system and how important it is to understand that at the end of the day, everything that you do is about course correcting what you’re doing on a daily basis. If you don’t take action, there is nothing to course correct. But when you take action, make sure that you can talk to someone that understands exactly how you’re doing things and can actually give you the feedback. The exact feedback and the course correction, so can become better and more efficient at what you’re doing. Okay? So in the meantime, I hope you guys enjoy this episode of Pyjama Bosses TV. And in the meantime have an amazing week, and I will see you again next week.